Intimacy with no emotional involvement is fueled by lust. Sometimes, you might think you're falling in love. At other times, you might think you're falling in lust. It can be difficult to determine if you’re feeling lust or a romantic connection with your new love. Researchers now understand that different phases of love are fueled by different hormones, according to biological anthropologist Helen Fisher, as reported in “Lust, Love, Like” for “Psychology Today.” Lust triggers the production of androgens and estrogens for short-term satisfaction, and oxytocin and vasopressin production create a more long-term connection. 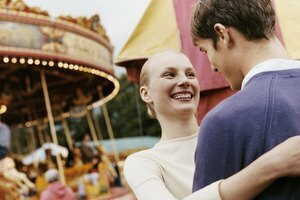 Lust begins when you notice that someone is attractive and that this brings you together, explains eHarmony staff in “Finding Love: Telling Lust from Love.” That feeling might never morph into love because it’s a surface attraction and lacks any real connection or knowledge of your love interest. It’s generally short term, and can disappear after intimacy but it can return later, according to Fisher in “Love Explained” on the Chemistry.com website. A romantic connection keeps you in the relationship, deepening as you get to know that person. Love can intensify after intimacy. Lust is an intense feeling that desires immediate gratification, according to psychiatrist Abigail Brenner in the “Psychology Today” article -- sort of like wanting to eat because you smell food cooking. Romantic attraction builds over time and is willing to spend the energy necessary to build trust, loyalty and an emotional attachment. You can nurture that romantic attachment by revealing more of yourself to your love, showing your vulnerability, spending time together and responding to your loved one's feelings and actions. Lust is very selfish, because it demands that the object of your attention should fulfill your wants quickly, according to psychologist Dr. Larry Crabb in the article, “What Is The Difference Between Love And Lust?” for the Help for My Life website. Love, on the other hand, is selfless and is willing to delay gratification to meet your sweetheart’s needs and wants. If you don’t care about whether the object of your attraction is happy or satisfied by your interaction, it is definitely lust and not a romantic connection. Lust can be directed toward more than one person at a time without jealous feelings, according to Fisher in her Chemistry.com interview. You might look at a group of people and feel an immediate and strong hunger for several people there and have difficulty deciding who to pursue. If you love someone, you will focus on that one person and make your way to her side. You might feel possessive if someone else is paying attention to your love or if your love is showing strong attention or affection to someone else. The bond you feel for that person makes you feel that the romantic attention from that person belongs to you. Rateliff, Kathryn. "Differences Between Lust and a Romantic Connection." Synonym, https://classroom.synonym.com/differences-between-lust-romantic-connection-18068.html. Accessed 23 April 2019.